Melbourne Renegades, meanwhile, beat Sydney Thunder for the second time in eight days. With only 120 balls to face in an innings, every batsman and team try all they could to make every chance count in order to score runs. 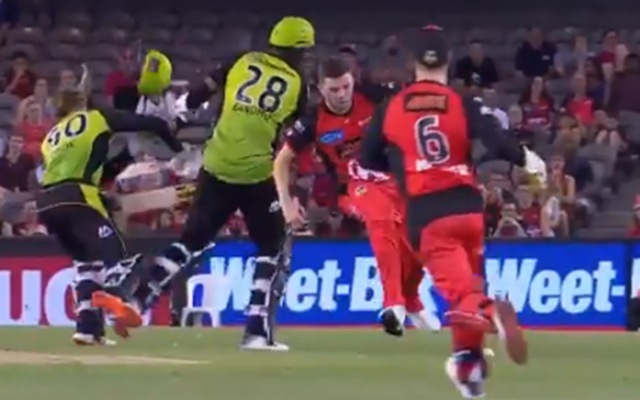 But sometimes the desperation and urgency to score runs can lead to catastrophic moments and something similar happened with Sydney Thunder batsman Jonathan Cook against Melbourne Renegades on Wednesday in the ongoing Big Bash League. The decision to steal a single towards the end of the innings not only cost Cook his wicket but also nearly injured him. The incident occurred in the 19th over of the innings. Batsman Gurinder Sandhu was totally deceived by a slower delivery from left-arm pacer Harry Gurney. However, the southpaw managed to put the bat on to the ball. The ball landed just in front of Sandhu and he set off for the single straightaway. Cook also obliged from the other end. In the meantime, Gurney also watched it and charged forward to stop the batsmen from crossing over. But in doing so, Gurney came in between both the batsmen and when he finally made his way out, both the batsmen ended up colliding against each other. Sandhu managed to keep his control but Cook fell on the ground and remained stranded in the middle as his helmet was all over the field. Gurney, who too was lying on the ground, threw the ball towards the wicketkeeper who did the rest. Melbourne Renegades, meanwhile, beat Sydney Thunder for the second time in eight days. Batting first, the Renegades were looking set for an embarrassing defeat after being reduced to 90 f0r 7. However, a whirlwind fifty from Cameron Boyce helped them turn the game on its head. Boyce, with a career T20 batting average of just 9.57, smashed five sixes and helped the Renegades take 39 from the last two overs of their innings to finish on 140 for 7. The score turned out to be more than enough in the end as the Thunder were all out for just 113.